Adams in front of his 2015 installation, Life, or Something Like It. The central sculpture shown in this detail from Life, or Something Like It is one of the artist’s favorites. …while in others, they seem to burst free. 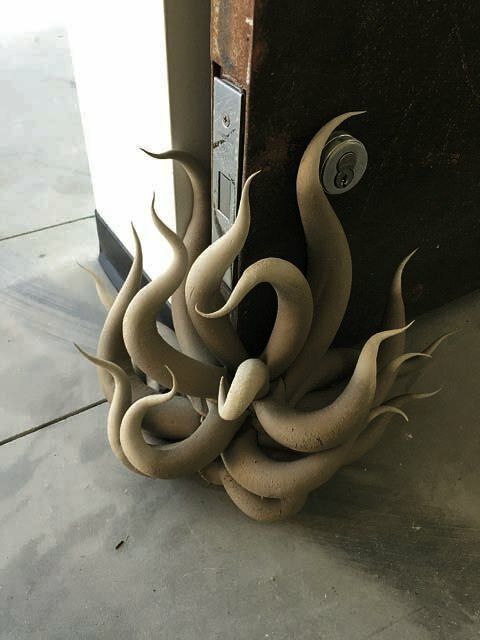 One sculpture acts as a kind of doorstop, greeting visitors from the ground. Full of some unknowable purpose, a little clay monster gesticulates from the kitchen countertop. Slightly damp, it resembles a newly hatched deep-sea cephalopod, or perhaps a plant sample from some desert planet. While a small kiln hums in the background of his Cambridge apartment, Christopher Adams ’94 smiles happily and, wrist-deep in a bag of dark brown clay, gets ready to start another. Adams is a dermatologist by day—and has also worked as a specimens collector for the Harvard Museum of Comparative Zoology, a consultant for an aquarium design company, and a scientific illustrator—yet it is his work as a ceramics artist that has drawn the most attention, earning him a position as Artist-in-Residence at the Office for the Arts at Harvard Ceramics Program. But Adams, who got his start in the medium as a student in high school and at Harvard, isn’t in it for the attention. Like the succulent plants, fish tanks filled with snails, and shadow boxes of insects that also crowd his sparsely furnished apartment, his artworks are the physical evidence of a craft he practices for his own pleasure, in order to find a home in the world. First comes the base, a small disk of clay with a hole in the center, like a donut. Then he begins to roll the moist, dark clay into slender coils. He pulls each length to a fine point and shapes it, adjusting its bends and curls with a series of delicate tweaks and nudges. With a small stylus, he then scores a cross-hatched pattern into the base and affixes the coil over it. He repeats this process 18 times until the final form emerges. Once built, the ceramics air-dry overnight before their firing. Afterward they can be dipped in glaze and fired again, as many times as desired, for striking combinations of color and surface texture. 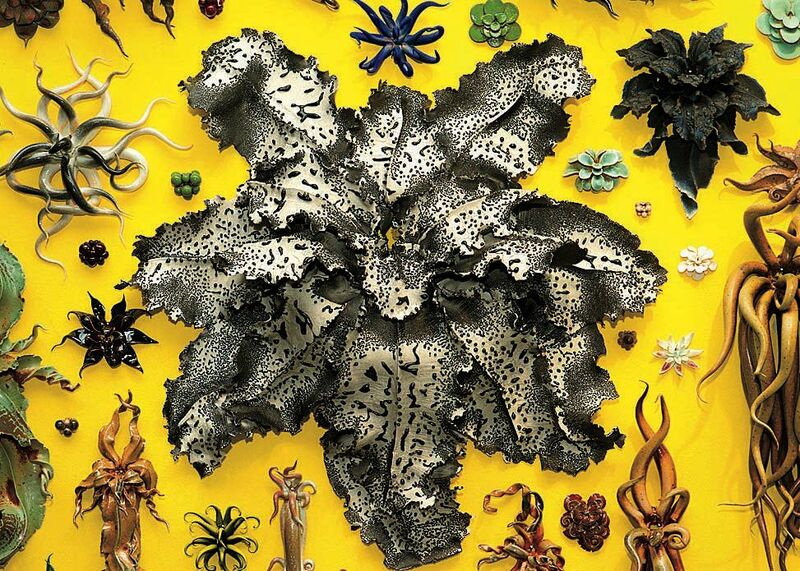 After a decade of working in this mode, Adams still doesn’t know what to call the objects he makes—they’re just his “things.” Critics sometimes assume the work alludes to specific, real-life organisms, but Adams himself resists drawing direct links between his ceramics and the natural world. 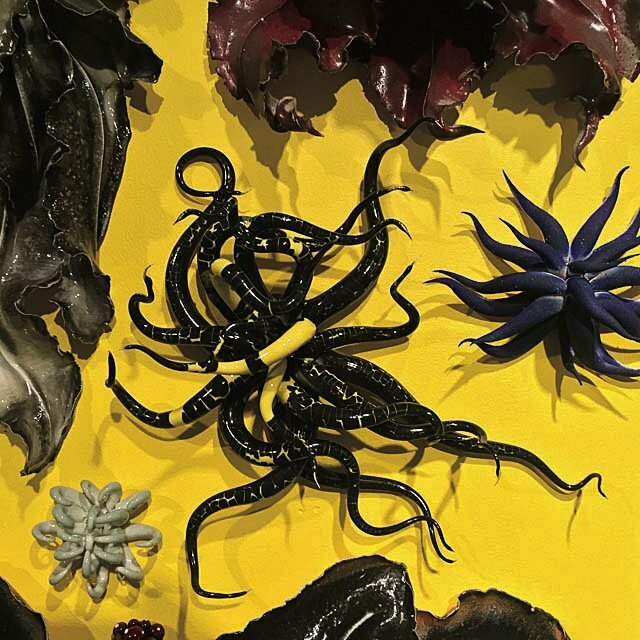 The things are not obviously identifiable as either flora or fauna, and if in some moments they seem familiar (a leafy formation that hints at lettuce, or a color combination reminiscent of a tropical beetle), in others they are decidedly alien: the deep black, metallic glaze that will coat the kraken in his kitchen will be unlike anything found in the wild. But, Adams explains, as he pieces together the tiny tentacled monster in front of him, he sets himself certain rules. 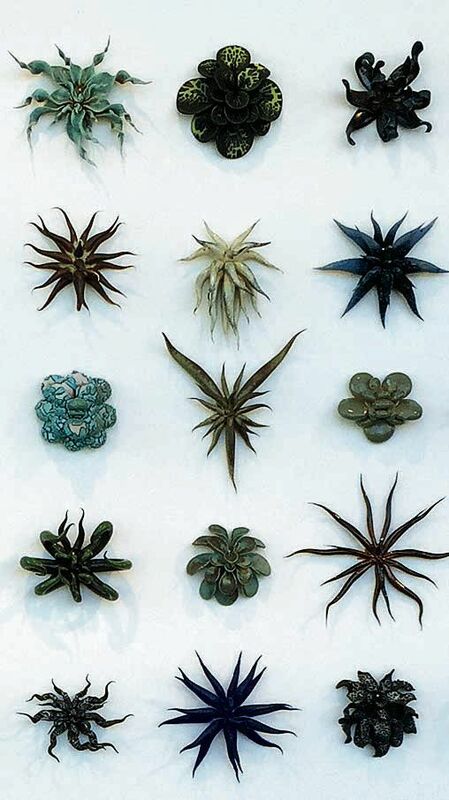 In this case, each object has 18 limbs, which are always assembled in the same order, clockwise around the base. He pursues variations on a given combination of forms to their natural end—as in nature, he says, a species tends toward dwarfism or gigantism—and produces anywhere from five to 500 objects within a specific class. When it stops evolving, he moves on. In his installations, density has an aesthetic effect—evoking an overcrowded terrarium, a proliferation of life just barely held at bay by the grid formation—but it’s also a product of necessity. Adams has made so many things that there’s literally nowhere else to put them. His studio space on campus, filled with tall racks loaded with crammed trays, has no room for him to actually work. Hundreds of works are scattered about his Cambridge home. Five years ago he purchased a 20-room Victorian farmhouse in New Hampshire—in no small part, he says, “for storage space.” The hayloft in the three-story barn there is alsocrowded with ceramic organisms, ranging in size from something that could be cradled in a palm to something that could easily strangle someone to death. He produces ceramics almost daily and nearly compulsively, but only through the intervention of a couple of friends in New York did he begin to show at all. Because his apartment was getting crowded, he acquiesced to their encouragement (or, as he puts it, their “not-quite-coercion”) to mount his first show at the Scope New York art fair in 2006; it sold out. Even now, while preparing a series for another exhibition, he tends to brush off considerations of meaning or audience. Asked why he continues to show his work, he responds (somewhat ruefully), “To be honest, I don’t really know.” He churns out and stockpiles these creations for himself, he says, because not doing it is worse. Since childhood, Adams’s interests have tended to manifest through obsessive collection. He calls himself “a quiet naturalist,” who has worked his way from his first childhood pet, an Australian water dragon named Ignatius, through beta fish, luna moths, an African freshwater puffer fish, and hundreds of insect specimens. In fact, it was a zeal for mail-order succulent plants that led to the development of the ceramic form he now favors: the wall-mounted objects started out as planters. 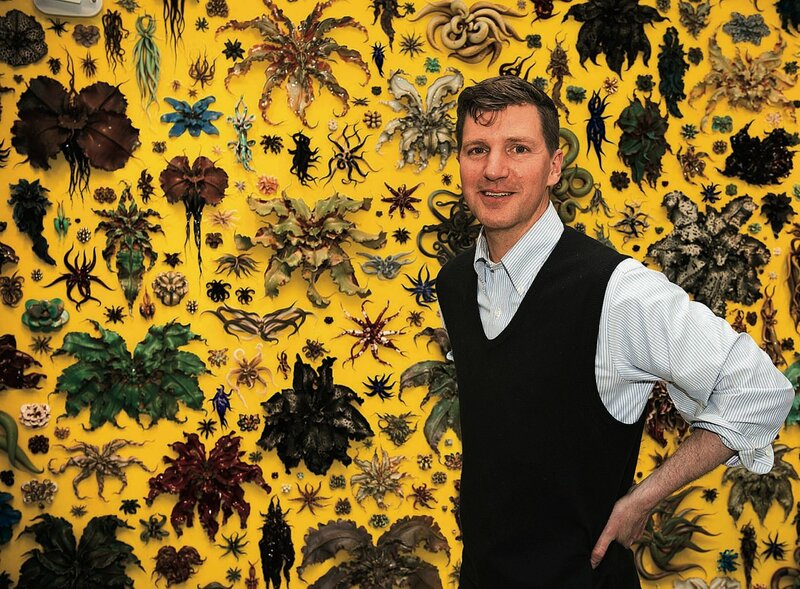 Even in his dermatology practice—which enables his ceramics habit, and brings structure to his life and human contact into his day—Adams is most excited when he gets to identify and classify plants (fungal infections) and animals (his favorite diagnosis—scabies). His devotion to nature does not always see returns: efforts to grow vegetables on the farm have been stymied by New Hampshire’s unforgiving climate, tomato hornworms, and a mischievous cadre of foxes, deer, and one “happy little woodchuck.” But the naturalist-at-heart takes an evenhanded interest, if not a certain glee, in what other people might consider dark, disappointing, or gross: all of it is part of the natural process. Glazing, too, is a notoriously fickle process; Adams has been described as “fearless” in his approach. Equanimity helps, in this art as in life. With another small smile, he says he likes the hornworms better than the tomatoes, anyhow.